Centerpiece Miniatures is an Australian based service located in Canberra, specialising in wargaming and board game miniature painting and conversions. Our core focus is on creating unique and eye catching hero & character models for your armies, board games or your display cabinet. 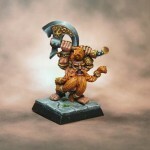 With that in mind, the commission costs reflect the differing miniature painting standards you may require. Centerpiece Miniatures focus on painting singular miniatures or small groups to the highest standard, though if you require a greater number of miniatures to be painted (armies) we now have dedicated painters for the task. From time to time, we will sell miniatures through our store. Our store operates under the name CenterPiece Miniatures Store. Miniatures sold through this store will ship internationally. If you have any questions, please feel free to contact us through our contact form. Wesley is the lead artist for Centerpiece Miniatures. He currently paints most of the miniatures from ‘Standard Quality’ and up, with his primary focus on Display Quality Miniatures. He’s an avid collector of armies from many of the popular gaming systems. Currently most images in the gallery come from Wesley.